When Java 7 Update 21 came out in March ( https://isc.sans.edu/forums/diary/Java+7+Update+21+is+available+-+Watch+for+Behaviour+Changes/15620 ), there was a fair amount of discussion about Java Whitelisting. This is a valuable feature, allowing you to permit execution of specific business applications based on Java, right down to nailing down specific Java versions for each app, and deny all other Java applications (from untrusted internet sites for instance). However, making this happen in a corporate environment (which in many cases means Active Directory) is not as straightforward as you might think - folks seem to think this is just too complex to tackle, and as a result we're not seeing a lot of folks using this feature. Let's cover this challenge from beginning to end. If you find a step that I describe that might be done better or differently, please let us know in the comment form at the bottom of this page. The first step of course is to define the business applications require Java, so that we know what to whitelist. I'll pick administration of my home firewall - the GUI admin for Cisco ASA firewalls is a java app. So for me, that app is https://192.168.122.1. In a real corporate setting this would generally use DNS and possibly a more complete URL. I still trip over business apps accessed by IP address, but we try to kill them off as we find them. Optionally you can also use the hash of the public certificate for the Java app. This is a better definition for the application, as this will remain consistent if you migrate to a different host or if you place the app on a load balanced farm of servers. <!-- Based on the Example Deployment Rule Set that allow a desktop administrator to control end-user's execution of browser applets. We now take this file and package it in a JAR file using a trusted certificate. This prevents your users from editing this file after it's distributed to bypass your defined policies. 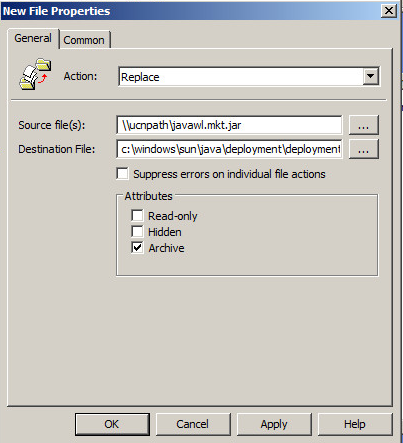 You'll need the full JDK for this (jar.exe is not in the JRE distribution). In a typical organizaation, you might have 7 or 10 different rulesets to whitelist various combinations of applications. How do we get these various combinations to the desktop? Note that the location is NOT in the specific user directories. So what happens when someone governed by a different policy logs into the host? However, as time goes on the lengthy and convoluted login scripts we had in the '90's are dwindling, and in many cases are now empty - people are using Group Policy for many of the things we used to get done in login scripts. So how do we do this in AD? We'll use User Configuration \ Preferences \ Windows Settings \ Files (there's a matching setting under Computer Configuration, but that's not so applicable to User Groups). Choose "New / File", and change the default to "Replace" - remember that there might be a file in the destination location, copied there for another user who might have different policy requirements. Update the source and destination paths. Save it, apply it as you would any other Group Policy ,and you're done! If you've got other Group Policy functions that you need to combine with this, you can use User Configuration \ Policies \ Windows Settings \ Scripts (Logon/Logff) \ Logon. 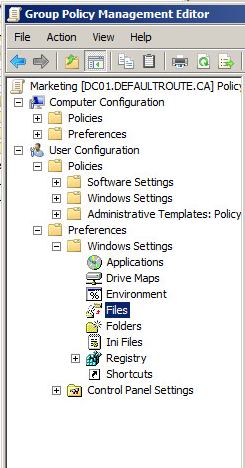 Consider this Group Policy setting to be today's version of yesterday's login scripts. This second method is quite a bit more complex - there's a number of file locations that need to be exactly right, and scripts that need to match them, but if you need more scripting done in your Group Policy than just copying the JAR files or other things that you can accomplish in other Group Policy settings, it's a good way to go. Either way you copy your JAR files, Group Policies are a central place to administer almost everything - if you can bolt on generic file copies to that, and can keep everything in one place, that's a HUGE win for simplified administration! And speaking of a "win" - once this is in place, your user community will have access to "blessed" java apps, but will not be able to execute any other java applications. Which means that when the next Java zero day is announced, you'll likely be able to sleep that night and not worry about what the next day will bring you at work! Again, if you've got a simpler or alternative way to get this job done, I'm certainly interested and so are our readers - please use our comment form to share!